The festival season is right around the corner and it is the perfect time to purchase a new phone. If you are in the market for a feature rich phone which will hardly dent your bank account, then Redmi 6A is perfect for you. I have put together 8 reasons why you must buy the Redmi 6A today. 8 reasons why the Redmi 6A is a must buy for one and all! Priced at Rs. 5999 and even lower if you purchase it during the Amazon Great Indian sale, Redmi 6A is affordable yet stylish. It is a perfect entry level phone with a decent camera and a great battery life. MediaTek Helio is a revolutionary smartphone platform that uses an ultra-efficient fabrication process. Redmi 6A comes with an Android v8.1 operating system with MediaTek Helio A22, 2.0Ghz Quad-core processor with 12nm technology. The Redmi 6A has a 5.54 inch touchscreen display. With a resolution of 720 pixels by 1440pixels, it is definitely the best in class at this price range. Dual nano SIM cards, 2 GB RAM, 16 GB storage expandable up to 256GB and a 3000 mAH battery are some of its other spectacular features. It also has a kickass camera but we will talk about it in our next point. With a 13 MP rear camera, the Redmi 6A is perfect for all the shutterbugs out there. It weighs only 145gms and would be perfect for clicking decent photographs with its f/2.2 aperture. The camera also has a burst mode, low light photo enhancement. A beautify mode, a portrait mode, age recognition and selfie timer; the Redmi 6A is perfect for all the selfie lovers out there! The Redmi 6A has a plastic body but a sleek finish. What I personally loved was the fact that the phone is available in four different colours. You can opt for black, blue, gold or rose gold. It has curved edges and looks very stylish. 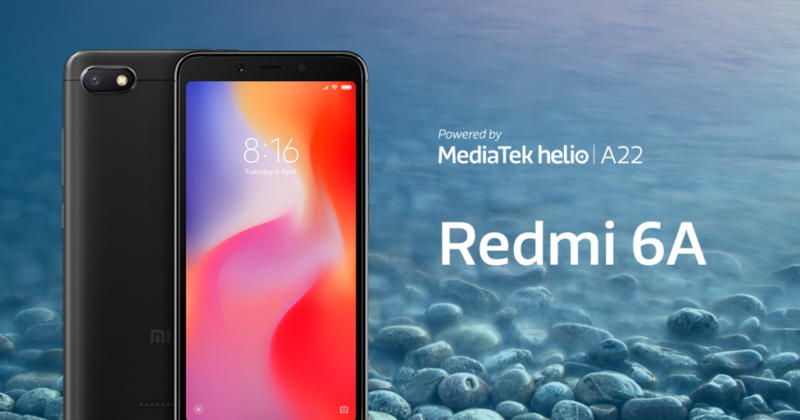 The Helio A22 is a revolutionary technology for inexpensive phones such as the Redmi 6aa. Other phones in the price category pale in comparison. It has four ARM Cortex-A53 cores running at up to 2GHz and is manufactured using a power-efficient 12nm process. This means that the battery life will be more than you would expect. The Redmi 6A has a 3000mAh battery and can easily last you for the entire day. Emojis, stickers, GIFs and more; the Redmi 6A has a cool range of inbuilt features to make conversations with friends more interesting. This is definitely one of the coolest features of the phone! You can now unlock your phone with just a glance. How cool is that? Cashback of up to Rs. 2300 on BookMyShow, Yatra, Swigggy and many others when you buy from the Amazon App. I don’t think you need any more reasons. Just go buy the Redmi 6A now! This phone sounds like a great deal. It sounds like it has all of the bells and whistles and would be great for anyone looking for a new phone. This phone looks like it has everything I want in a phone: great battery life, great camera, great price. Now that is a very nice device. I would totally consider getting one. I just bought a new phone but wish I have known this phone before. This looks nicer and on a budget. I am always on the go, and hate having to carry around too much stuff. I use my cellphone for everything, including serving as my camera. Looks like this one has a great camera option! This is perfect, have to show this to a friend of mine before she buy her new phone. Wow! This is really something else, you’ve done a great post and very informative as well. This sounds like a really a good phone, and amazing that the battery lasts that long. Something for my hubs to consider, he is looking for a new phone. This sounds like a great phone. I am a selfie queen; meaning I take lots of picture. And all that requires great battery life and a nice captivating camera. Redmi 6A does look to be great quality. My phone should probably be changed soon so this is something I might look at to switch over to at that time. Redmi 6A sounds amazing! A good camera is a huge selling point for me! i haven’t heard of this brand before. long battery life and great camera are what i look for on mobile phones. I wish my phone offered screen replacement, that is an awesome feature! Personally I am stuck with my Iphone, I wish I knew about this phone before I got mine. Seems like a great phone, thank you for your lovely review! I am in the search for a new phone right now! Sounds like a great phone! I appreciate the newer phones with amazing cameras and that’s a great battery life. I didn’t hear about this brand before. I am all about camera so I would like to see some examples of photography taken with this phone. It sounds like it has a good camera. This sounds amazing! I love a good battery life and camera!! Long battery life is a HUGE factor when picking out a new phone. Nice to know this one also has a good camera, another essential! I am a Redmi user for more that four years and I can say that this device is really great, the camera and the battery life is so good and it never gives me any problem. My phone is still working properly and not having any problem in using it or even changing any part of it. I will definitely check this one and will also share this with my friends. I never heard of this phone before. I need a phone with a good camera, lots of storage, and long battery life, sounds like this need to be my next phone. that’s awesome you can use a timer to take a selfie! Looks like a good phone to consider for those who don’t need all the fancy functions of a big brand name phone with it’s corresponding big price tag. I never heard of this phone before, but I am a fan of the android side of phones. Battery life of only a day though? I know it depends on usage but current smartphone lasted for about 5-6 days on a charge with normal use. WIll definitely look more into this though because I expect to get a new phone soon! I’ve never heard of this brand before, but it sounds like something I would use regularly. And the pricing sounds fantastic – I’ll definitely have to check it out now. Thanks so much for the review!